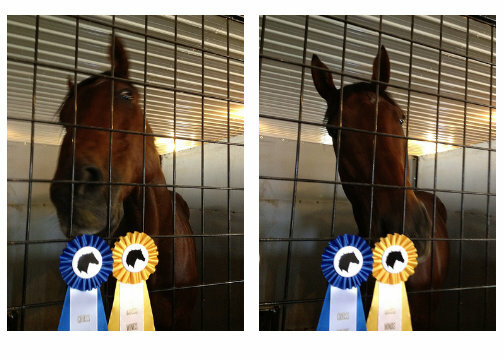 Derby showing off his ribbons. He won a blue one, and a yellow one. Good boy, Derby! We went out to our third show yesterday, with better results all around. 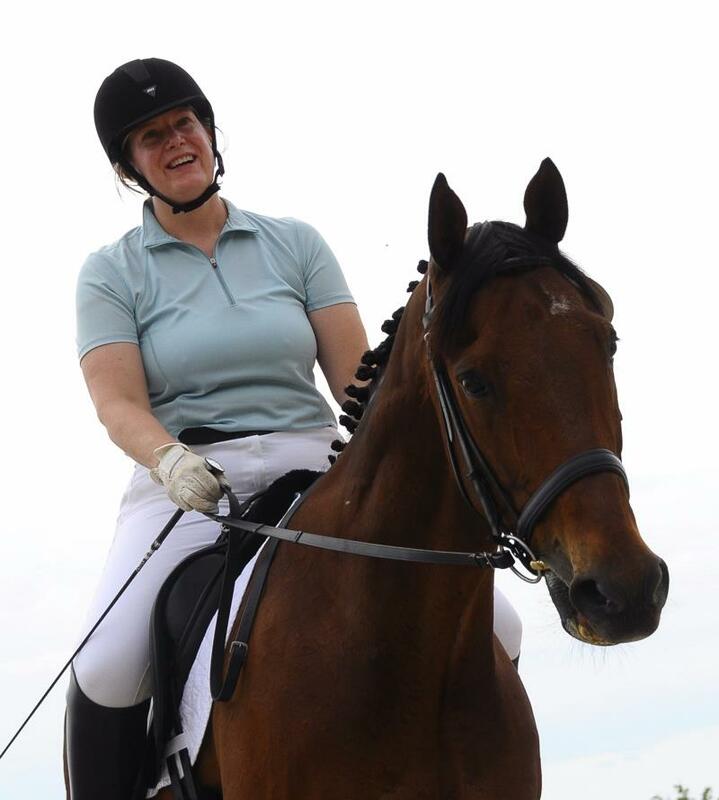 My riding improved, and there were no unscheduled dismounts. Along the way, we picked up our second qualifying score for the IDCTA schooling show championships, so we’re now qualified at Intro. 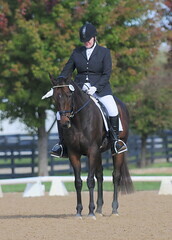 Derby and I also won our first blue ribbon together. It was a good day! This artsy shot is courtesy of fellow rider (and now working student) Caitlin. Upon arrival at Cross Winds Farm, I got Derby settled in then took him for a walk. He was pretty chill at first, and enjoyed picking the clover growing near the rings. When Boomer and Peaches (who were showing with us) came out with their riders to have a look around, he became a bit unhinged. He reared and levitated and was doing his impression of a 1,000 lb kite. I regretted not bringing a regular (or even a rope) halter with me, because I didn’t have a lot of control in the padded shipping halter. Luckily, Derby didn’t yank the shank out of my hands, and he eventually settled down. 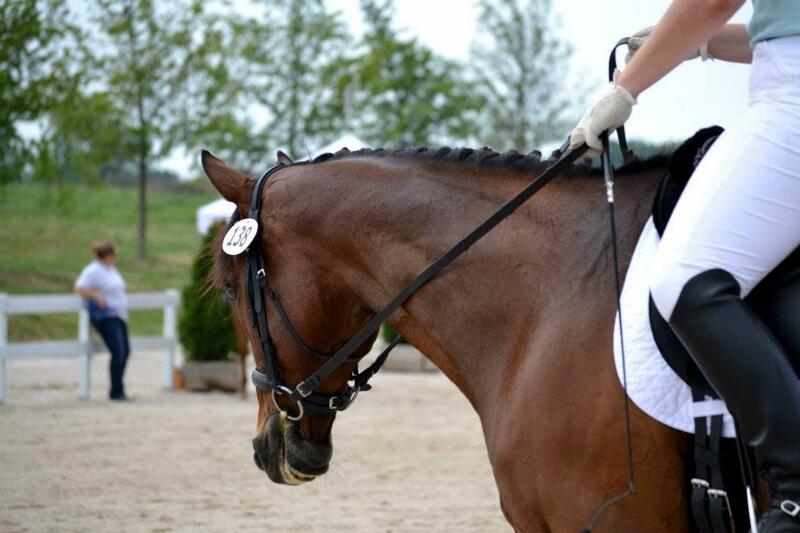 We had plenty of time before our ride, so I braided him, groomed him and then got on for our warm up. The day threatened to grow warm, but it was still pretty cool and breezy when I mounted up. We did a light warm up, and things were okay but not great. He was a bit distracted (but not naughty at all) and I will admit right off the bat that I was feeling a bit defensive. I really didn’t want to wind up in the dirt again! Life would be easier if I could just turn off my internal worrier. The first test was okay. Derby was obedient, but we weren’t dazzling. He (and I) were both bit tense but I was able to get a decent free walk out of him and some decent moments of roundness. We finished with 57% and change, good for third place. I had almost 50 minutes until my next ride, and was thinking about getting off to rest a bit, but the Derby spooked twice in rapid succession in the warm up, so I put him to work. As we worked, I got and kept his attention, and things started feeling (and looking, according to Christy) pretty good. In a nearby ring, the jumpers got going, and Derby was pretty interested in them, giving me a new challenge just when I thought we had everything worked out. I doubled down on keeping him busy, and once again, got the horse to come back to me and relax. In retrospect, both Derby and I would probably benefit from doing more work in our initial warm up. A decent halt, despite the dang fly. Photo courtesy of Suzie Ridenour (http://suzanner.zenfolio.com/). We were finally called for our second test, and I worked my half-halts after greeting the judge as I headed for A. Derby was feeling great! Then, as stupid luck would have it, just as we were doing our final circle and heading in, a giant B-1 bomber of a horse fly started buzzing Derby. Up popped his head just as we entered. Crap! Needless to say, our first centerline and halt weren’t great. But we got right to task and had a much better ride in our second test. The energy and connection and consistency were all improved. 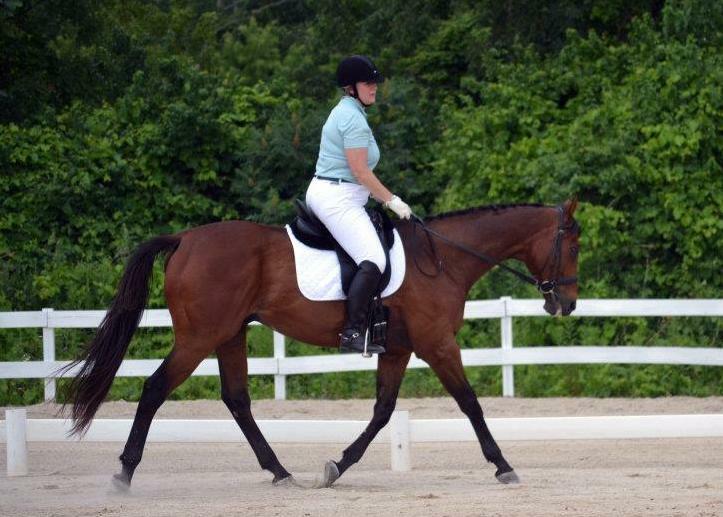 Our trot diagonal was solid and our circles felt pretty good. Christy was grinning like a skunk and on our way out told me that we looked better in the ring than we had in long time, even at home. I hopped off Derby and back to the barn we went. 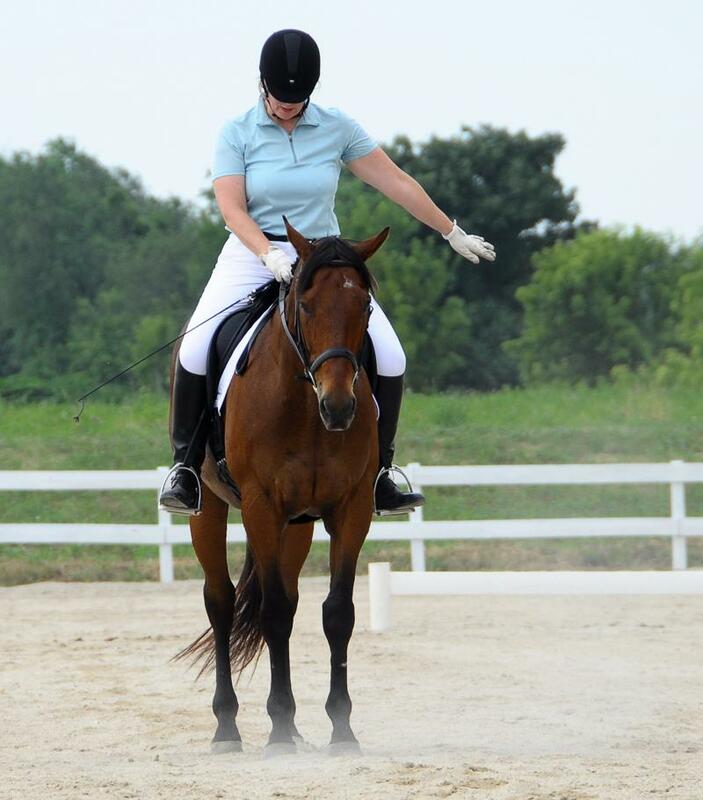 He was definitely pooped and his saddle pad was dripping. After untacking him, I peeled my show clothes off and then gave him a quick currying, fresh water and hay, and then stuffed him with cookies before running out to watch some of the others ride so he could have a well-deserved nap. After the lunch break, I went to the office to pick up my test, and was delighted to learn that we had won the class with a score of 60.6%, which is just enough to qualify for the schooling show championships. 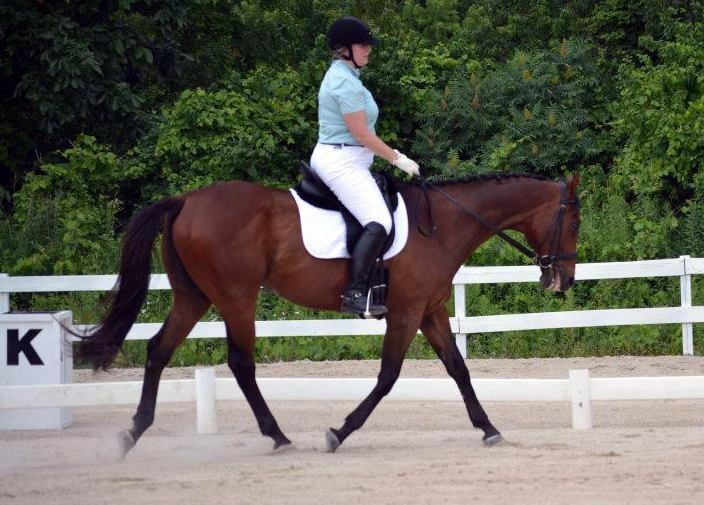 The judge echoed what I hear from Christy almost every day – that I have to get that hind end engaged and improve my connection. I will be focusing on that in coming weeks. We don’t have any shows planned in the near term, but I’m very happy that it’s not even (technically) summer yet and I’ve been out 3 times and have my qualifying scores. I would still very much like to get out at Training this year, but to get there I’m going to have to really work hard on getting Derby forward into the contact (which really means that I need to ride confidently). And I have to keep working on improving my seat. Always that. So, a lot lies ahead, but we are off to a decent start. I’m itching to ride today, but Derby’s getting the day off. He worked hard yesterday so I’m going to let him chill and roll in the mud (it finally rained last night.) Work begins anew on Monday! We were both happy to be done with the last test! Photo courtesy of Suzie Ridenour. Photo note: My friend Suzie Ridenour took some of the pictures you see above. She’s a professional photographer and graciously allowed me to use some shots here on the blog. She does some amazing work, ranging from nature shots to portraits. View her work here: Suzie Ridenour Photography. Enjoy! Congratulations Sarah – well done!